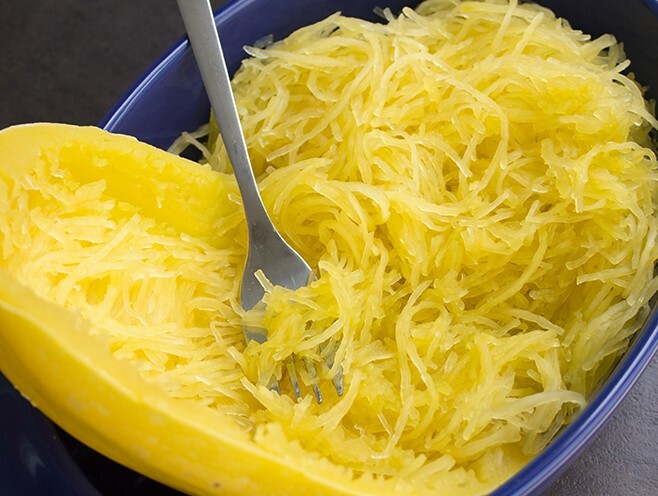 Spaghetti Squash is healthy, gluten-free, paleo-friendly and very versatile as a main dish or a side. Substitute it for pasta in your favorite pasta dishes, toss with your favorite spaghetti sauce, or add chicken and toss with olive oil and fresh herbs. 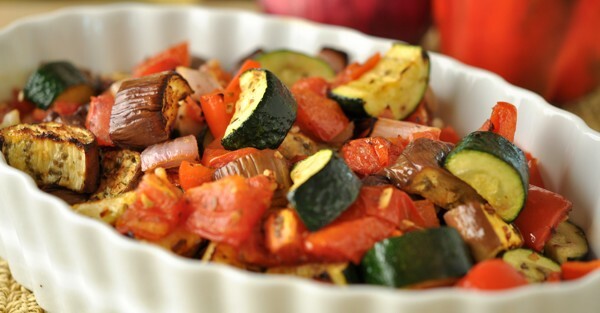 Dr. Dana recommends serving it with Roasted Eggplant Ratatouille over the top! Using a sharp knife, cut the squash in half lengthwise and place, cut side down, in a baking dish. Add enough water to come 1/2-inch up the sides of the baking dish and bake for 45 – 60 minutes, until the squash is easily pierced with a paring knife and very tender. Remove from the oven, uncover, and allow to cool slightly. Using a fork, gently pull the strands of squash away from the peel and place the squash strands into a mixing bowl. Brush Eggplant Slices with Olive Oil, sprinkle with salt and pepper and roast until soft, about 20 – 30 min, turning them about half way through. Set aside and let cool. Once cool enough to handle, place on a cutting board and cut into 1/2-inch pieces. Heat a large pot over medium-high heat and add 1 tsp Olive Oil. Add onions, red pepper flakes, salt and pepper and sauté until soft, about 5 minutes. Add the peppers and garlic and season again with salt, if needed. Cook until peppers are soft, 5 – 10 more minutes. Add the roasted eggplant, zucchini, summer squash, tomatoes, and herbs and continue to cook until the squash is soft, 15 – 20 minutes. Stir in the balsamic vinegar, adjust seasoning and serve. It is super yummy on its own or served over spaghetti squash.